Paediatric Surgery, King Fahad Specialist Hospital, Saudi Arabia. Gastrointestinal Basidiobolomycosis (GIB) is a rare fungal infection caused by an environmental saprophyte, which could be easily misdiagnosed. Since 1964 only 72 cases have been reported in the English literature up to date . In this paper we describe two incidences presented with right iliac fossa mass, weight loss and eosinophilia. The first case was diagnosed by a colonic biopsy, while for the second case we used a percutaneous true-cut biopsy. Both cases received medical treatment without surgical resection. It is important to report GIB cases to highlight this emergence fungal infection, with emphasizes on the effectiveness of antifungal therapy treatments without undergoing surgical resection. An eleven years old boy from southern-west region of Saudi Arabia presented with three weeks history of intermittent colicky right lower quadrant abdominal pain associated with low grade fever and decreased appetite. Physical examination revealed 5 × 5 cm firm mobile non-tender right lower abdominal mass. Laboratory investigation showed normal white blood cell count (9.29/ mm3) with marked eosinophilia 1.84 (19.9%), ESR 48 mm/h, CRP 12.2 mg/dl and LDH 160 unit/l. Ultrasound (US) examination revealed a heterogonous mass measuring 7 × 3 × 3 cm with multiple para-aortic lymph nodes enlargement in addition to a small area of free fluid in the pelvis (Figure 1). Computed Tomography (CT) scan of the abdomen revealed mass lesion at the right iliac fossa with circumferential wall thickening involving the terminal ileum and cecum, with significantly enlarged regional lymph nodes (Figure 2). The presentation was suggestive of malignancy mainly lymphoma, as well as other inflammatory causes (Tuberculosis vs. Crohns disease). Colonoscopy was done and it showed large ulcerating, fragile mass in the cecum and ascending colon (Figure 3). The histopathology result of colonic biopsy showed minimal crypt distortion, cryptitis and foreign body giant cells, which were negative for neoplasm. Accordingly we elected to proceed for laparoscopic exploration that revealed amass involving thickened ileum, caecum and ascending colon with enlarge regional lymph node. Lymph node was sent for frozen section and it showed no malignancy with remote suggestion of tuberculosis. At that point we decided to give the patient, the benefit of doubt and conclude the surgery. The final histopathology was reactive lymph node with increased number of eosinophil, negative for primary lymphoma, metastatic malignancy or granulomatous inflammation. A multidisciplinary meeting with Gastroenterologists and Infectious Disease (ID) specialists raised the possibility of fungal infection. Therefore further investigation including a colonic biopsy with especial staining (PAS) for fungal organisms was done. This revealed single hyphae with features suggestive of basidiobolomycosis (Figure 4). The patient was prescribed voriconazole 200mg orally to be taken twice daily. The U/S was repeated twice, the first was done after one month revealing a marked regression of the mass, and the second was done after one year that concluded a complete resolutionof the bowel wall thickening and disappearance of the enlarged lymph nodes (Figure 5). A two years old boy referred to our hospital witha onemonthhistory of abdominal pain and progressive abdominal distension. He showed symptoms of loss of appetite, loss of weight, constipation associated with intermitted fever and no night sweat. On examination the child was febrile (39.5°C) but vitally stable. 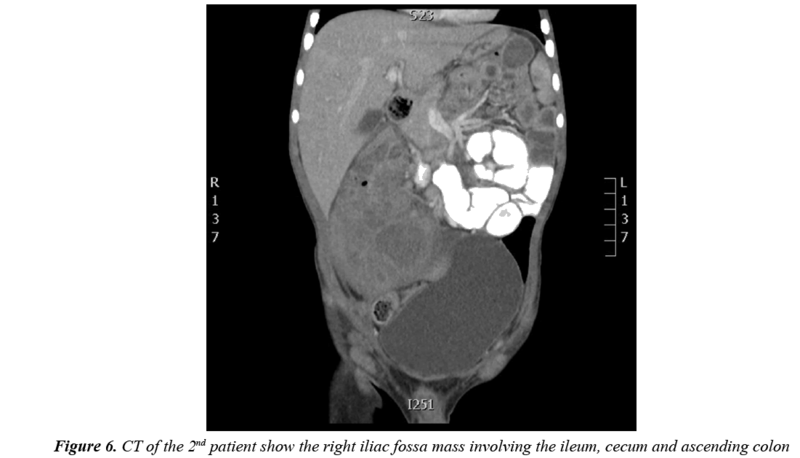 His abdominal examination revealed a soft, lax distended abdomen with an irregular palpable tender mass at the right iliac fossa measuring 8 × 4 cm, in addition to enlarged left inguinal lymph nodes. Laboratory result showed leukocytosis WBCS 23.3/mm3 with marked eosinophilia 14%, ESR 85%, CRP236 mg/dl and LDH 637 unit/l. An abdominal CT-scan was ordered and revealedan irregular circumferential mural thickening with pseudo-mass formation involving the ileum and caecum, the whole mass measured 8.1 × 6.8 cm in transaxial plane and 10.6 cm in craniocaudal dimension, with no proximal small bowel dilatation and mild enlarged regional lymph nodes (Figure 6). Our clinical impression at this point was either lymphoma or a fungal infection. Therefore, a US guided true-cut biopsy was done; the histopathology reported an eosinophilia rich mixed inflammation with rare epitholioid granulomas and rare structures suggestive of fungal hyphae with no malignant cells. According to the above reports, the patient received voriconazole infusion for one week and then continued it orally for 12 months. The US was repeated at 6 week and showed interval regression of the mass (74% volume regression).The patient becomes symptoms free. And on follow up patient continuum clinically and radiologically free. Basidiobolomycosis is arare fungal infection caused by Basidiobolus ranarum, an environmental saprophyte found worldwide . It usually presents as subcutaneous infection that affects mostly young males with no evident risk factors . This type is known to be transmitted through traumatic inoculation . Gastrointestinal basidiobolomycosis (GIB) was first reported in 1964 in a six year old Nigerian boy . After that it was described in the USA 1986, since then several cases have been reported mostly from tropical and subtropical regions out of these reported cases 29 were children [1,2,7-8]. There are no clear ideas how the fungus reach the gastrointestinal tract, but ingestion of soil or animal faeces or food contaminated by either, seem to be the possible route . GIB is an increasingly recognizable infection withsubstantial diagnostic confusion, morbidity and mortality . The diagnostic dilemma mainly due to two factors firstly it affected healthy immunocompetent individuals with no identifiable risk factors and secondly there is no specific clinical manifestation; the second factor make this type of disease easy to be confused with chronic infection (such as tuberculosis), inflammatory bowel disease and Abdominal malignancy which is the most presumptive diagnosis at presentation [9,10]. GIB affects mainlysmall bowel and colon , however stomach, liver, pancreas and renal system can be involved as well . The common presenting symptoms are abdominal pain and palpable abdominal mass associated with fever and weight loss . It may present with complication like bowel perforation, obstructive uropathy, esophageal varieses, dudenobiliary fistula or even death . Laboratoryresults usually show leukocytosis with marked eosinophilia, elevated erythrocyte sedimentation rate (ESR) and C-reactive protein (CRP). Culture of B. ranarum from clinical or surgical specimens is the gold standard and it may provide the correct diagnosis in suspected cases, however, the characteristic histopathological picture of chronic granulomas rich in eosinophil and the splendore-hoeppli phenomenon (fungal hyphae surrounded by radiating intensely eosinophilic granular tissue) are the usual diagnostic tool [4,10]. In GIB (B. ranarum) the colon is usually involved, wherethe causative agent lies deep beneath the mucosa; a colonoscopic biopsies as a diagnostic modality may be non-representative . But in exceptional cases, fungal hyphae may be detected , as in our first patient.This is in contrary to which has been reported by Jarie et al. .
Intraoperative finding usually reveals soft-to-firm masses involving the bowel, mesentery, andadjacent organ with regional lymphadenopathy. Reviewinga case series of 44 patients, GIB was diagnosed during surgical excision in 37 cases, while the rest was diagnosed based on autopsies, stool cultures, colonoscopic biopsies, colonic mass biopsies and liver mass biopsies; with no further details of one case . This infection responds well to antifungal therapy. The role of surgical excision is still unclear. Aggressive surgical intervention is not mandatory for all patientsand can be reserved for complication, e.g. perforations or obstructions . Further studies to determine the exact role of surgery in the management of GIB is recommended. In addition, further investigation on the best approach whether is surgical, medical or a combined modality is also recommended.According to our patient’soutcome we believe that medical treatment alone can be curative. According to this report we believe that GIB infection can be treated using antifungal medication alone. And aggressive surgical interventions can be reserved for complication only. Also it is clear that colonoscopic biopsy may have a role in the diagnosis of GIB. Geramizadeh B, Heidari M, Shekarkhar G. Gastrointestinal basidiobolomycosis. A rare and under-diagnosed fungal infection in immunocompetent hosts - A review article. Iran J Med Sci 2015; 40: 90-97. Bennet JE. Diagnosis and therapy of systemic mycoses in the immunosuppressed host. Transplant Proc 1973; 5: 1255-1257. Kian Joe L, Pohan A, Tjoei Eng NI, et al. Basidiobolus ranarum as a cause of subcutaneous mycosis in Indonesia. AMA Arch Derm 1956; 74: 378-383. Hussein MR, Musalam AO, Assiry MH, et al. Histological and ultrastructural features of gastrointestinal basidiobolomycosis. Myological Research 2007; 111: 926-930. Edington GM. Phycomycosis in Ibadan, Western Nigeria: two postmortem reports. Trans R Soc Trop Med Hyg 1964; 58: 242-245. Schmidt JH, Howard RJ, Chen JL, et al. 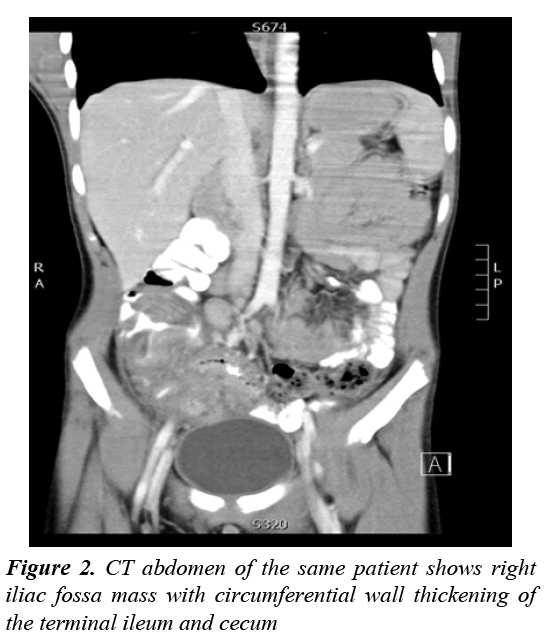 First culture proven gastrointestinal entermophthoromycosis in the United States: A case report and review of the literature. Mycopathologia 1986; 95: 101-104. Al-Shanafey S, Al Robean F, Bin Hussain I. Surgical management of gastrointestinal basidiobolomycosis in pediatric patients. J Pediatr Surg 2012; 47: 949-951. AL Jarie A, AL-Mohsen I, AL Jumaah S, et al. Pediatric gastrointestinal basibolomycosis. Pediatr Infect Dis J 2003; 22: 1007-1014. Lyon GM, Smilack JD, Komatsu KK, et al. Gastrointestinal basidiobolomycosis in Arizona: Clinical and epidemiological characteristics and review of the literature. Clin Infect Dis 2001; 32: 1448-1455. Nemenqani D, Yaqoob N, Khoja H, et al. Gastrointestinal basidiobolomycosis: An unusual fungal infection mimicking colon cancer. Arch Pathol Lab Med 2009; 133: 1938-1942. Vikram HR, Smilack JD, Leighton JA, et al. Emergence of gastrointestinal basidiobolomycosis in the United States, with a review of worldwide cases. Clin Infect Dis 2012; 54: 1685-1691.